As the single remaining kosher butcher in Chicago in a neighborhood that once boasted one on “every other street corner,” as Shainwald remembers growing up, simplicity that has been Romanian Kosher's key to success. The Rogers Park company first opened in Albany Park in 1957, moving to its current location in 1965 to serve what was then a rapidly growing Orthodox Jewish population in the area. The restaurant has always been in family hands, with members of the Loeb family still working there today. At its height in the mid-1960s, the West Rogers Park area was two-thirds Jewish, with an Orthodox population of about 30,000 people. 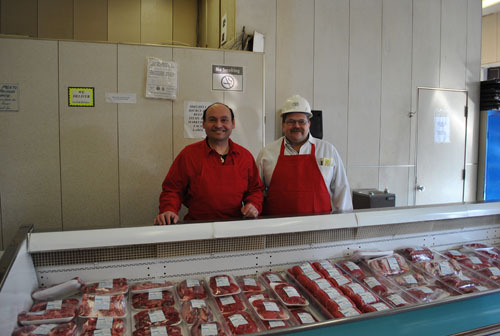 At that point, as Shainwald recalls, “there was literally a kosher butcher on every block or every other block.” He worked at three different butchers as a teen, and in his 30 plus years at Romanian has witnessed the steady decline of kosher butchers in the neighborhood. “I looked in the yellow pages and I couldn’t find another kosher butcher in Chicago itself; there are some in the suburbs, but as far as in the city itself this is the last one,” Shainwald said. As the last kosher butcher in the city of Chicago, Romanian employees say disappoint. Lining the back wall of the deli counter and organized from youngest to oldest, the kosher salami is made in-house and displayed for all to see. Fading eggshell blue tiles line the walls behind the sausages and salamis, above which sits an old-style "take-a-number" machine for when the shop gets busy. A hand-written sign informs customers that all their products are under rabbinical supervision to ensure the food is strictly kosher. And while some customers may gripe that employees are not super-friendly or warm-and-fuzzy, the regulars know what to expect. “I’ve been going since I was a kid, and you learn to look past the impatient employees because it’s so rare to find good kosher meat at these kind of prices, especially around there,” Gabovitch said. And it doesn’t really worry Shainwald anyway, because to him and the rest of the Romanian family, the meat is king. “Sometimes our customer service may not seem the best, but we work harder at giving them the better product than necessarily smiling all the time,” Shainwald said. That ‘better product’ Shainwald is so proud of is popular not only amongst those who keep kosher but Chicagoans around the city. Romanians Yelp! page speaks for itself, employee Richard Levin said. All reviewers thus far have given Romanian either five stars or four – mostly due to a lack of customer service – and reviews range from commenting that nothing compares to Romanian’s Polish dogs to thanking the butcher for restoring said patron’s “faith in meat in a casing,” and everything in between. “Kosher meat in general is more expensive than general, but neighborhood people come in and they keep coming back, irrelevant of the price, because they know what they’re getting – good quality, fresh meat,” Levin said. And like their secret of success, their product is simple and unfussy, too. “We have a really clean label,” Shainwald said. “It’s basically meat and spices – there’s no binders or assorted ‘other’ stuff in there besides meat and spices. What’s in it is right there on the label, we’re not hiding anything.” The meat, bought from kosher slaughterhouses in and outside of the city, is made and packaged in the back of the store. As of yet, Romanian only ships non-perishables like it’s beer sticks and hard salamis to places outside the city, but a website – and a move into the 21st century – may be arriving soon. “We’re humble, too,” Levin added.